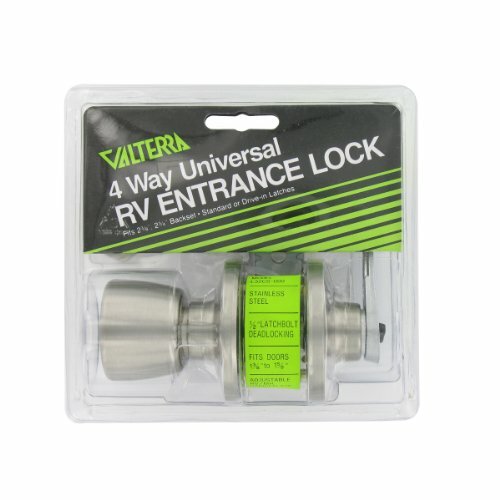 Valterra Universal Entrance Door Lock, 4-Way. Entrance locks feature stainless steel finish; a panic-proof inside knob; solid steel interior; 5-pin tumbler; solid brass key cylinder and 1-piece latch housing with 1/2 Inch latch bolt. For 1-3/8 inch to 1-3/4 Inch doors. 2-3/8 inch or 2-3/4 Inch backset. Units work in standard or drive-in configurations. Not available in keyed-alike. Viewpack. Knob x Lever.